Dawn Kopman Whidden is a native New York author who grew up in the close-knit community of Little Neck Douglaston during the baby boomer era. She graduated from Queensboro Community college. Twenty years ago, she traded in her days of living in the bustling city for a more serene and tranquil life on a small farm in the town of Bell, located in North Central Florida. She is retired and shares her life and love with her husband of fourteen years and an adopted stray dog she named Casey. She has also been blessed with two beautiful grandchildren. Are we a product of nature or nurture? Was Brad a product of abuse or that of an evil seed, born to kill? 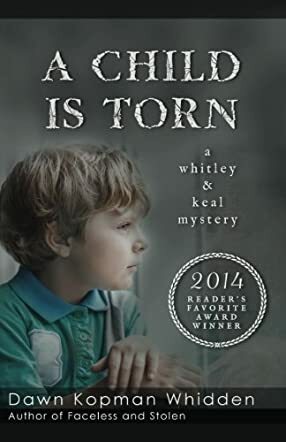 In A Child is Torn; Innocence Lost, by Dawn Kopman Whidden, Dr Hope Rubin is sent in to evaluate and treat a child who has just confessed to the brutal bludgeoning of his mother and father. The ten-year-old seems normal and calm while playing Super Mario, but he is covered with blood and Officer Marty Keal isn’t certain whether the boy is telling the truth about what happened or leading them on a wild goose chase. The boy’s father, Evan Madison, was a very dependable employee and his mother levelheaded as well. The investigators can find no shred of evidence to suggest that the child was ever mistreated, but something had to have set the boy off. Detective Jean Whitely makes it her mission to discover the facts. Is he telling the truth or covering up for someone? What is the truth about Brad? A Child is Torn; Innocence Lost is a hair-raising thriller that digs into the origins of the motivation for murder. Dawn Kopman Whidden has created a literary masterpiece that will send a chill down your spine every time you look at your child innocently playing a video game. Attempting to understand the evil that lurks about, driving even the cutest and most innocent toward brutal violence will have any reader scratching their head and looking over their shoulder. Suspenseful, thrilling, and masterfully developed; A Child is Torn; Innocence Lost will make the reader wonder if it is safe to go to bed at night. As soon as I saw the cover of "A Child Is Torn ~ Innocence Lost" I wanted to read it. The boy pictured on the front had an eerie yet innocent look about him. I found the concept of this debut psychological Thriller an interesting idea that I had not come across before. It made me want to read more about nature vs nurture which I know very little about. I have an almost 10 year old myself so to think this could actually happen was a very scary thought whilst reading this well thought, original idea. I really liked how all the characters were interwoven with one another and seeing how their relationships developed. I loved the sweet love story that ran through the book. A great read and I am now going to read Dawn's follow on book Faceless "A Mystery" to see how the characters develop further. I wish to Thank the author for giving me a copy of "A Child Is Torn ~ Innocence Lost" in exchange for a fair and honest review. A wonderful start to many books to come.